This airy bedroom has a clever detail that I really like. Any guesses? The curtain/side table combination. I love how that jade green stripe continues from one edge of the window to the other with the table in the middle included. Helps unify that area and keep it clean to the eye, allowing the pillow shams to catch your attention first. And bonus points for this idea being achievable with a little DIY magic...any plain white curtains will do and just embellish away. You could probably even paint the large stripe onto the fabric which would be super easy. I also love how high the curtains are hung and, of course, the bamboo blinds. And you'll never go wrong with a statement bed. 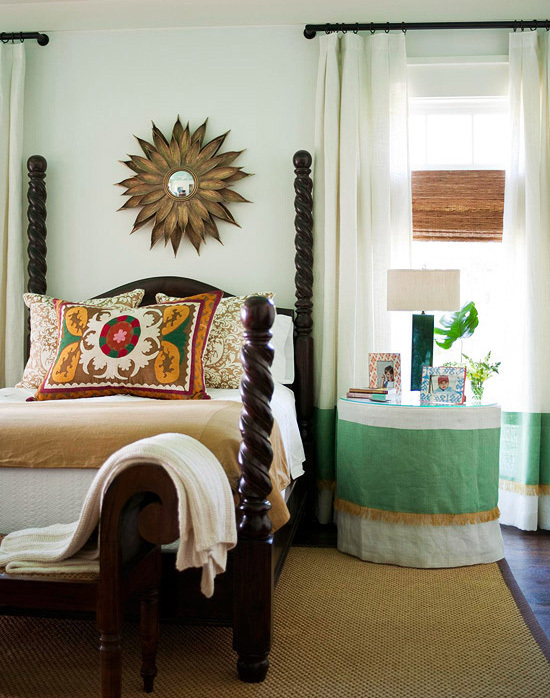 This bedroom is comprised of simple pieces put together in a thoughtful way...love that. Isn't that Jenny from LGB's project? She is so crazy talented. Is it? I found the image on bhg.com with no credit for designer/photographer....would love to link it over to Jenny if it is!